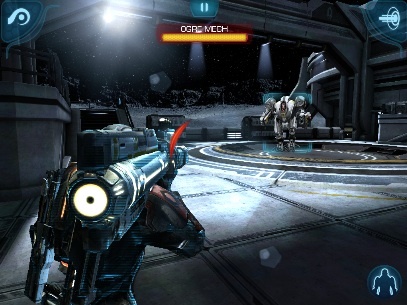 BioWare's sci-fi franchise makes a splash on iOS, though unimpressive controls put a damper on the fun. 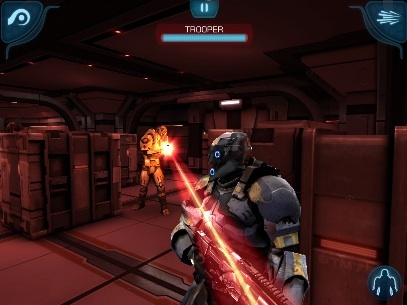 The fight to save the universe doesn't end when you leave the house, thanks to Electronic Arts' newest iOS adventure, Mass Effect Infiltrator. Created by IronMonkey Studios, the same talented group behind the critically acclaimed Dead Space, this title compliments Mass Effect 3, offering a similar experience with new character Randall Ezno, a disillusioned Cerberus agent that has no qualms blowing holes through Turian Snipers, Geth Troopers and Krogans. First, the game looks incredible. It's a fully 3D third person shooter with a heavy emphasis on action. You'll plow through enemy infested areas, taking cover and then popping out to annihilate swarms of troops using the assault rifle, shotgun, sniper rifle and the all-powerful beam that basically lays waste to just about everything it touches. In addition, the game includes Biotics. Pull, for instance, lets you suspend a selected and defenseless enemy in mid air. Leash, on the other hand, gives you the chance to fling evildoers around the playfield. It's in your best interest to kill with skill, since each checkpoint awards you a rating across three categories (Style, Time and Health). On top of that, credits earned during battle can be used at the in-game store to purchase new weapons, abilities and upgrades that turn Randall into a more efficient killing machine. What's especially interesting is the control scheme. Although you move within a 3D space with a virtual analog stick, you cannot open fire until the game highlights enemies. From there, you simply tap the desired target, and Randal unloads until the ammo counter reaches zero; weapons auto reload. The designers also employ gestures to vault over objects and move to cover. The entire system works all right, but suffers from a handful of issues. Swiping also maneuvers the camera, so oftentimes, we'll go to vault, and the game misreads the command. This is especially troublesome during firefights, where Randal accidentally winds up in harm's way and gets killed. Not only that, but it's a real drag having to wait for highlighted enemies to appear, as opposed to just shooting them whenever you want. 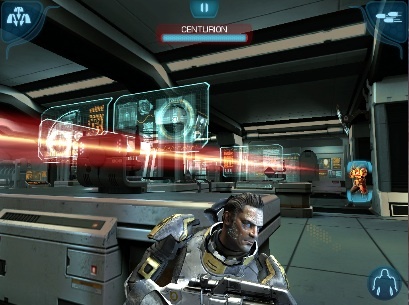 For some odd reason, the highlight system goes haywire when soldiers are within a few feet of Randal, which almost always results in their getting in a few cheap shots while we frantically search for cover. And, similar to Dead Space, the majority of the game follows a very predictable pattern, where you run down an empty hallway, battle some enemies, rinse and repeat. A few boss fights break up the monotony, but they're few and far between. You can also forget about actually speaking to people and selecting different responses, ala the console games. It's nonexistent. Same goes for morality. The game occasionally presents you with the option of choosing Paragon or Renegade, but decisions have little impact. Despite these problems, Mass Effect Infiltrator provides a small slice of the big budget experience on a portable device, and there's a wonderful sense of satisfaction that comes from cutting through a small band of soldiers. It also helps that it's easy on the eyes and presents a decent story. That makes this game worth checking out, especially if you love the franchise. What's Hot: Beautiful visuals dripping with detail, enjoyable combat, multiple items and upgrades, connects to Mass Effect 3 via Origin. What's Not: Controls can be a real pain, voice acting not up to par, narrative light on details.